Conductive polymers--polymers that conduct electricity--have applications in telecommunications, electronics, materials science, chemistry and physics. The four self-contained volumes of this handbook thoroughly explore all aspects of conductive polymers including chemical and physical properties, technology and applications. 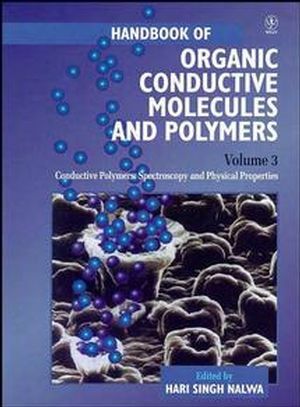 Hari Singh Nalwa is the editor of Handbook of Organic Conductive Molecules and Polymers, Volume 3, Conductive Polymers: Spectroscopy and Physical Properties, published by Wiley.